﻿ Fun Easy English - Environment - Global warming - Climate change Impacts on Transportation. In the United States, transportation systems are designed to withstand local weather and climate. Transportation engineers typically refer to historical records of climate, especially extreme weather events, when designing transportation systems. For example, bridges are often designed to withstand storms that have a probability of occurring only once or twice every 100 years. However, due to climate change, historical climate is no longer a reliable predictor of future risk. Climate change is projected to increase the frequency and intensity of some extreme weather events. Specifically, heat waves will likely be more severe, sea level rise could amplify storm surges in coastal areas, and precipitation will likely be more intense. These changes could increase the risk of delays, disruptions, damage, and failure across our land-based, air, and marine transportation systems. Most transportation infrastructure being built now is expected to last for 50 years or longer. Therefore, it is important to understand how future climate might affect these investments in the coming decades. Climate changes will likely impact roadways, ice roads, vehicles, and railways. Higher temperatures can cause pavement to soften and expand. This can create rutting and potholes, particularly in high-traffic areas and can place stress on bridge joints. Heat waves can also limit construction activities, particularly in areas with high humidity. With these changes, it could become more costly to build and maintain roads and highways. On the other hand, certain areas may experience cost savings and improved mobility from reduced snowfall and less-frequent winter storms since warmer winters may lead to reductions in snow and ice removal, as well as salting requirements. Climate change is projected to concentrate rainfall into more intense storms. Heavy rains may result in flooding, which could disrupt traffic, delay construction activities, and weaken or wash out the soil and culverts that support roads, tunnels, and bridges. Exposure to flooding and extreme snow events also shortens the life expectancy of highways and roads. The stress of water and snow may cause damage, requiring more frequent maintenance, repairs, and rebuilding. Road infrastructure in coastal areas is particularly sensitive to more frequent and permanent flooding from sea level rise and storm surges. Approximately 60,000 miles of coastal roads in the United States are already exposed to flooding from coastal storms and high waves. Furthermore, major highways in coastal areas serve as critical evacuation routes. Evacuation routes must be protected from flooding and damage so they may be used for emergencies. In some locations, warmer temperatures are projected to cause more winter precipitation to fall as rain instead of snow. Winter flooding could occur more frequently if the frozen ground cannot absorb precipitation. 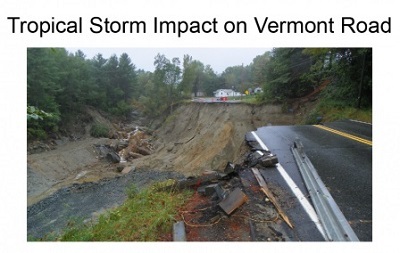 Landslides and wash-outs could also occur more frequently, as saturated soils are exposed to more rainwater. Drought in areas such as the Southwest could increase the likelihood of wildfires that reduce visibility and threaten roads and infrastructure. Freezing temperatures are required for ice roads in Alaska. These are frozen routes used to connect northern communities, as well as the oil, gas, and mining industries. The tundra beneath these frozen roads is fragile, so transportation is limited to periods when the ground is frozen. Warming temperatures would reduce the number of days when ice roads are open, limiting transportation access to these areas. To learn more about the impacts of climate change on transportation infrastructure in Alaska, please visit the Alaska Impacts & Adaptation page. As temperatures increase, many types of vehicles can overheat, and tires will deteriorate more quickly. However, milder winters, reductions in the number of cold days, delays in winter freezing, and earlier spring thaws may reduce cold-weather damage to vehicles. High temperatures cause rail tracks to expand and buckle. More frequent and severe heat waves may require track repairs or speed restrictions to avoid derailments. Heavy precipitation could also lead to delays and disruption, and tropical storms and hurricanes can also flood or leave debris on railways, disrupting rail travel and freight transport. For example, the June 2008 Midwest floods closed major east-west rail lines for several days. Like roadways, coastal railways and subways are subject to inundation from sea level rise and storm surges. This is particularly true in underground pathways and tunnels, which are often already below sea level. For example, after Hurricane Sandy hit New York City and New Jersey subway and commuter rail systems with a 14-foot storm surge, millions of people were left without subway service for over a week in 2012. Damages from flooding may require rail lines and subway infrastructure to be rebuilt or raised in future expansion projects. Climate changes may impact airplanes, airports, and airstrips, affecting air travel and infrastructure. Periods of extreme heat can affect aircraft performance and may cause airplanes to face cargo restrictions, flight delays, and cancellations. However, warmer weather in winter will reduce the need for airplane de-icing. In the winter and spring, increased rains and flooding may also disrupt air travel. Storms can force entire airports to close, as occurred along the Gulf Coast during Hurricane Katrina and throughout the Northeast during Hurricane Sandy. Climate change may increase the frequency of these events and the number of airports that are affected. In addition to causing closures or delays, flooding may damage facilities, including airstrips. Thirteen of the 47 largest U.S. airports have at least one runway within 12 feet of sea level, making them particularly vulnerable to coastal storm surge and inundation. 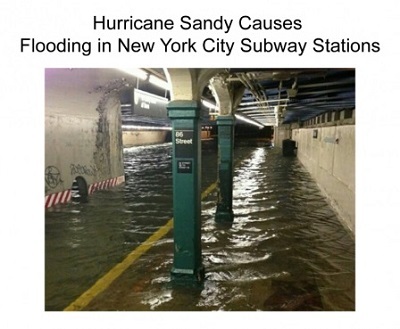 For example, in the tri-state area of New York, New Jersey, and Connecticut, many critical transportation infrastructure facilities (including Newark and LaGuardia airports) lie within the range of current and projected 50-year coastal storm surges. Many airstrips in Alaska are built on permafrost (perennially frozen soils). Warmer temperatures will thaw permafrost and cause the ground to settle, potentially damaging the foundation and structure of key infrastructure. Runways and airports may require rebuilding, relocation, or increased maintenance. Climate changes will likely affect marine transportation infrastructure and logistics in many ways, both positive and negative. Ships are sensitive to many factors, including the depth of a channel and the extent of sea ice. Increasing temperatures could reduce the amount of sea ice in many important shipping lanes, extending the shipping season. Warmer winters will likely lead to less snow and ice accumulation on vessels, decks, and rigging in marine transportation. In the Arctic, warmer temperatures could also open up the possibility of a Northwest Passage during portions of the year, which could reduce shipping times and distances. However, these new passages may also provide a pathway for invasive species transport and survival. Shipping lanes experiencing sea level rise will be able to accommodate larger ships, reducing shipping costs. However, higher sea levels will mean lower clearance under waterway bridges. In inland waterways where water levels are expected to decline, as in parts of the Great Lakes, ships could face weight restrictions, as channels become too shallow. Changes in precipitation can affect shipping in many ways. Flooding could close shipping channels, and increased runoff from extreme precipitation events could cause silt and debris to build up, leading to shallower and less accessible channels. Channels that are not regularly maintained or have a lower capacity to store sedimentation are more vulnerable to abrupt disruptions in service. More severe storms could also increase disruptions in marine travel and shipping. In areas experiencing increasing drought, water levels could periodically decrease, limiting inland shipping on rivers. Like other coastal infrastructure, harbor facilities, including docks and bridges, may have to be raised and fortified to accommodate higher tides and storm surges as sea levels rise. The combination of relative sea level rise, land subsidence, and more intense hurricanes and tropical storms could lead to significant disruptions and damage. 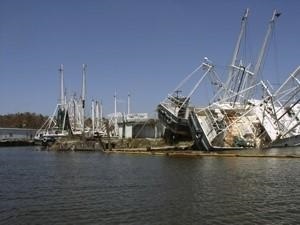 One particularly vulnerable area is the Gulf Coast, which is home to seven of the 10 largest ports in the United States, and brought in 56% of the oil imported into the U.S. in 2011. 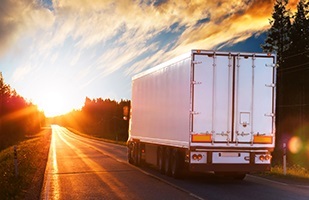 Climate change is likely to damage transportation infrastructure through higher temperatures, more severe storms and flooding, and higher storm surges, affecting the reliability and capacity of transportation systems. Coastal roads, railways, ports, tunnels, and airports are vulnerable to sea level rise, which could lead to delays as well as temporary and permanent closures. Climate change impacts will likely increase the cost of the nation’s transportation systems. Under the U.S. 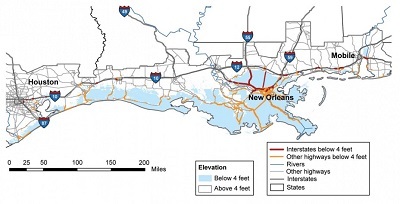 Global Change Research Program, the Department of Transportation, in partnership with the U.S. Geological Survey, is conducting a detailed case study on the impacts of climate change on transportation systems and infrastructure in the Gulf Coast region. The first report of this study focused on the impacts of climate change on Gulf Coast transportation systems and infrastructure. The second report (released partially in 2012 and 2013) provides tools and guidance to help state and local transportation planners assess vulnerability and adapt to potential climate impacts. In 2008, the National Research Council’s Transportation Research Board conducted an in-depth study of the impacts of climate change on land, marine, and air transportation in the United States. The report recommends that state and local governments, as well as private infrastructure providers, incorporate climate change into long-term improvement plans, design, and operations and maintenance activities. It also discusses the potential benefits of using “smart” technologies for monitoring infrastructure, reevaluating infrastructure design standards, updating maps used for flood insurance, and integrating climate change into transportation and land use planning.